Otoscopy is commonly used to examine the inside of the ears, nose, pharynx, and colon. 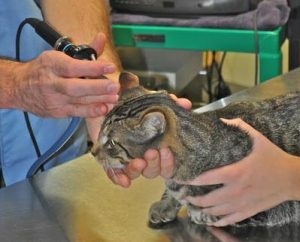 To perform this procedure, the veterinarian inserts a digital otoscope (a long tube with a camera at one end) into the area to be examined. The area being examined can then be viewed on a monitor and precise procedures can be performed. Otoscopy sometimes requires a pet be placed under anesthesia. As with all such procedures, we follow strict protocols and continually monitor the patient’s vital signs to help ensure his or her safety. Please see the descriptions under Anesthesia and Patient Monitoring for more information on what we do to keep your pet safe. If you have any questions about our otoscopy service or what to expect during your pet’s procedure, please do not hesitate to ask.